Or maybe there already is a (dead) thread of this sort, and I missed it? Maciek, I keep reading that e mail...but I cannot see specified what opera you were watching. While you are at it, you might as well tell us why we ought to avoid it. In the process I just discovered that I can not minimize this program, go to another and retrieve it. It's gone. Lis, LOL....after all that, I am none the wiser as I know neither the opera nor the composer. The longer we go on the less I seem to know. In memory of Colin Graham, who died last Friday, I watched this DVD of his ENO production of Britten's Gloriana. I saw the production in New Orleans in 1984 with practically the same cast, just a couple of months after it was filmed. I had the DVD of Gloriana with Josephine Barstow and I am sure it was the same production as the one with Sarah Walker, the one you saw life. I traded my Barstow 'Adriana' for the Walker because the facial contortions of Barstow drove me nuts! I could have just listened to the music, but the production is so beautiful, I wanted to see it all. So I lost Tom Randle in the trade-off, I survived the loss! I am sorry to hear about the opera world losing Colin Graham, a gentleman of the treasured old style, if I can take this Gloriana production as the norm of his style. I had the DVD of Gloriana with Josephine Barstow and I am sure it was the same production as the one with Sarah Walker, the one you saw life. Actually the DVD with Barstow is Phyllidia Lloyd's Opera North production. As I understand it, the film, also directed by Lloyd, makes a lot of cuts in the opera that weren't in the stage production. I also saw Graham's production of Previn's A Streetcar Named Desire when it was done in New Orleans, but I wasn't tempted to buy the DVD of that one (Previn's fault, not Graham's). Interesting news! The sets on both productions were so similar, I thought the same director was at work! Something else interesting: I had the Previn Streetcar and tried at least five times, over a period of time, to stick with it longer than half an hour, but not even Rod Gilfry's bare chest could keep me interested. Since I am not familiar with the original work, I hoped I could understand the singers but René Fleming's elocution is atrocious, no help from her. Don't worry, Mike. I'll start a separate thread on that as soon as I finish looking through the new posts on interesting threads that have cropped out while I was away. Or should I be looking elsewhere? Marvin, based on your criteria above, this version would probably fill the bill very nicely. 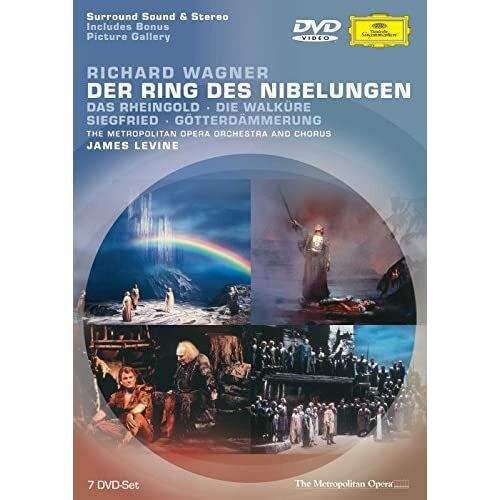 (Caveat: I have not seen the entire DVD set, but all four operas were done by the same production team, headed by Otto Schenck.) They are all very traditional -- no one in suits. The last I knew the Met was the only performance that used the clothing style from the actual historical times. All other productions were modern dress. I have the performance you are showing and enjoy it. Ps. My grandson thought the dragon looked more like a squid than a dragon in the Met's performance. I had to agree with him. LOL! Not completely correct, Anne! There is the outstanding series from De Nederlandse Opera, Amsterdam, directed by the very talented Pierre Audi. No raven-winged helmets, aluminum breast-plated females and tenors in leather miniskirts. The costumes are a fantasy creation resembling nothing in existence and very beautiful. This Ring has been judged by a majority of Ring advocates as the best DVD available to-date. Thanks Bruce and Anna, I have just ordered the Levine Ring! I tried looking for the Pierre Audi set couldn't find it at an affordable price...Levine won out in the end! Thanks, Lis. I had forgotten about the Amsterdam Ring. Are there any pictures available of that production? I'm curious to see what the costumes look like. Try this one, it's the cover of Rheingold with John Bröcheler as Wotan. Thanks! Guess I missed the boat when this Ring was reviewed. That costume looks fine. How are the singers rated? and the orchestra/conductor? Don't bother to look it up. I meant that perhaps you remember what was said. Trying to get a copy of my review of Die Walküre from my files to here, hope it works. - By gosh it did! Inevitable it is not only for you, T.C., but for any Wagnerian to see this production. Not a traditional ‘NY Met Otto Schenk’ tear jerker; nor a ‘Seattle Green Ring’, and definitely not a ‘Bloomers-dropping Stuttgart Konwitschny’ one. The word ‘monumental’ comes to mind because the sets are huge, clean-lined and stark, with the costumes to match. No frills, no exhibition of bare body parts or raven-winged helmets plus animal skin costumes. Concentration was fixed on the singing, acting and music. Hartmut Haenchen led his orchestra as powerful as any I have heard. The ‘Ride of the Walküre’ must have shook the foundation of the Muziktheater. I have stated more than once that Walküre is my favorite segment of the Ring, but I still wish Herr Wagner would have deleted two-thirds of the cackling herd of Walküren as they gather after singing their Hojotohos. Not only are we introduced to their names, we also get treated to the names of their horses, what those critters are doing – one stallion going after a mare – and all that sung by eight females with questionably good voices. As if that is not enough, Brünnhilde comes running and pleading with each of the eight, again telling me their names, to protect her. – That’s the time for me to go to my study and check for email or PMs from friends at GMG! – For some reason it is in this scene Jeannine Altmeyer’s voice gets a bit shrill, but I blame the surrounding eight sisters forcing her to raise her voice. After Wotan sends his daughters packing, except his favorite one, I settle back and enjoy the opera again. “War es so schmählich was ich verbrach?” is a heart-wrenching outcry starting the most dramatic part of this opera. “Leb wohl, du kühnes, herrliches Kind” is handled so many different ways by any of the Wotans I have seen and heard; this one too is different because Brünnhilde is already prone on the floor, arms by her side, shed of her armour and helmet, wearing only a black body suit. Wotan stands a few feet from her and actually has his back turned to her, making it more like a conversation he his carrying on with himself, recalling the wondrous times the two had together. He slowly turns around, walking towards her and kneeling down by her head and then his: “Denn so – kehrt der Gott sich dir ab: so küsst er die Gottheit von dir“ he stretches himself out on the floor beside her, bends over her face and kisses her on her mouth, with a long lasting kiss. He sinks his head down on her shoulder, drapes his left arm over her body and remains in this position all through one of the most beautiful musical passages of the Ring. Usually the interval is being used by Wotan to arrange her armour over her body, adjusts the helmet, places her sword next to her. Not this time. Motionless, father and daughter, and the music. It is a beautiful idea of the director Pierre Audi! Then of course the Feuerzauber we are all familiar with, except Haenchen takes it more powerful, not the usual sweet sound of flames created by the piccolo; an abbyss breaks the stage floor behind Brünhilde and a shiny metal barriers moves into place, symbolic of a barricade protecting her. Stunning! And so was the shattering applause from the house. There was no hesitatent remaining in their seats, from what I could see, everybody jumped to their feet, applauding, whistling, foot-stomping! All of it fully deserved!"